How do Replacement Windows Keep Your Home Cool in the Summer? Did you know that running a large central air system can cost you $245 per month during the summer? While air conditioning is a modern luxury, it certainly can help the dog days of summer feel a little more bearable. However, even the best air conditioners can’t keep your home cool if your windows are old and drafty. Drafty windows account for up to 25% of a home’s energy loss, which can skyrocket during the hot summer months. One of the most popular reasons homeowners install new windows is to conserve energy. But how do windows keep your home cool in the summer? Vinyl window replacement is one of the most ideal upgrades for a cooler home in the summer. This is especially the case for vinyl window frames that contain chambers for extra insulation. By insulating these pockets, it becomes much more difficult for cool air in the home to escape through the window frames. Since vinyl frames can help reduce heat transfer, homeowners will ultimately experience a cooler home during the hottest days. Not only are vinyl frames energy efficient, but they also are easy to maintain. During the summer, the sun can beat down on the window frames and cause damage such as fading. One way to help avoid this situation is by choosing high quality vinyl frames, which are better capable of resisting heat. Untreated wood windows can undergo extensive fading during the summer. While wood window frames can be repainted after fading, it becomes an endless cycle of repainting or staining every year to keep the windows looking beautiful. Perhaps one of the most important technologies for keeping the home cool is low-e. Low-e, which is short for low emissivity, is one of the best solutions for reducing heat transfer through a window. It’s a colorless and odorless application that’s thinner than a human hair. It’s applied to the glass during manufacturing and is responsible for helping the window to keep cooling costs low during the summer. But how does low-e work, exactly? According to the Department of Energy, heat is transferred in three ways: convection, radiation, and conduction. Low-e helps keep the home cool by controlling heat transfer via conduction and radiation. With heat transfer via conduction, heat travels through solid objects such as roofing, an entry door, and even walls. Heat is transferred primarily through the window’s glass unit, but low-e can block the heat from making its way through. Radiation is the travel of heat via visible and nonvisible light. It’s the same concept of feeling heat coming from the stove without directly placing your hand on it. With older windows, this radiation is allowed to pass through since there is no coating to stop it. You can help block the radiation by using curtains, although this requires the curtains to remain closed and compromises the amount of natural light in the home. However, low-e technology will block radiation from making your home too warm. It can also help reduce UV damage in the home, such as fading floors and furnishings. Argon and krypton are two odorless and colorless gases. This gas is inserted between the glass panes during the engineering of the window. Both gases are denser than air, although krypton is denser than argon. Argon and krypton gas provide insulation properties that keep the home at a consistent temperature, whether it’s 5 degrees or 85 degrees. When argon and krypton is combined with low-e glazing, it brings the temperature of the window closer to the temperature of your living space. This creates a cool and comfortable environment for the home. Solar Heat Gain Coefficient, otherwise known as SHGC, is the amount of solar radiation that makes its way through a window’s glass unit. This is measured with SHGC ratings between 0 and 1. The lower the number of the rating, the less solar heat the window transmits. Even the most energy efficient windows won’t keep the home cool if they’re improperly installed. Incorrect installation leads to a myriad of problems, with one of the most notable issues leading to energy loss. Energy loss occurs in this situation due to air escaping through areas such as the sash, the frames, and where the sash meets the sill. Locking the window can help create an airtight seal, but even the smallest mismeasurement can result in a home that feels hot even when the air conditioning is running. 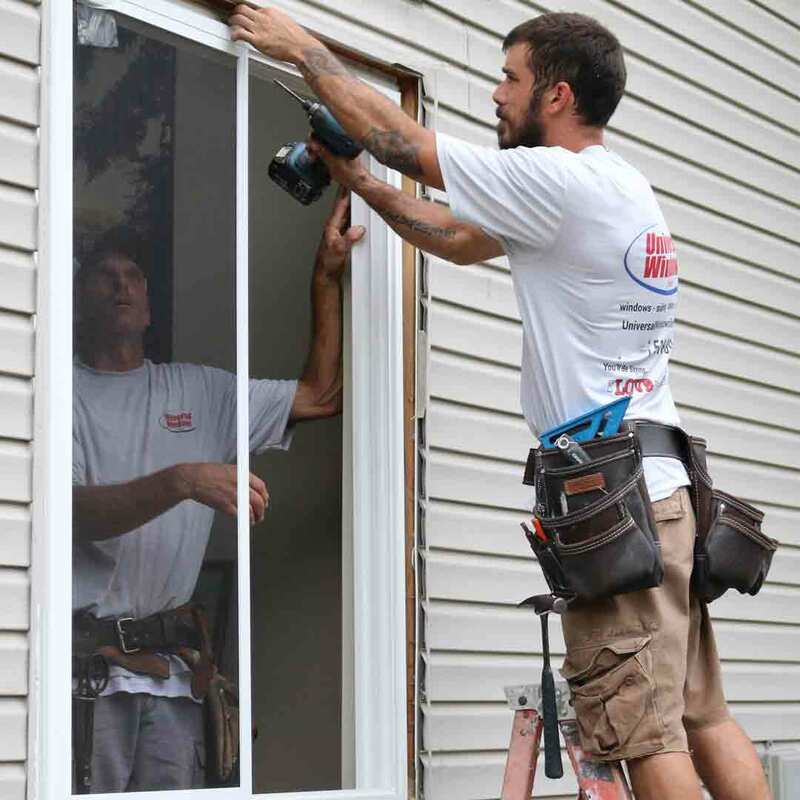 Before you choose to install replacement windows with energy savings in mind, be sure that you hire a professional window installation company. It might cost a little more upfront, but your savings will be greater in the long run. How Much Will You Save this Summer with Energy Efficient Windows? While it’s impossible to put an exact dollar amount on how much savings you’ll ensure with new window replacement, Energy Star gives us some ballpark ideas. This climate map shows how much homeowners can save on energy bills based on climate. These savings aren’t all-inclusive for summertime---it’s intended as savings for the entire year. 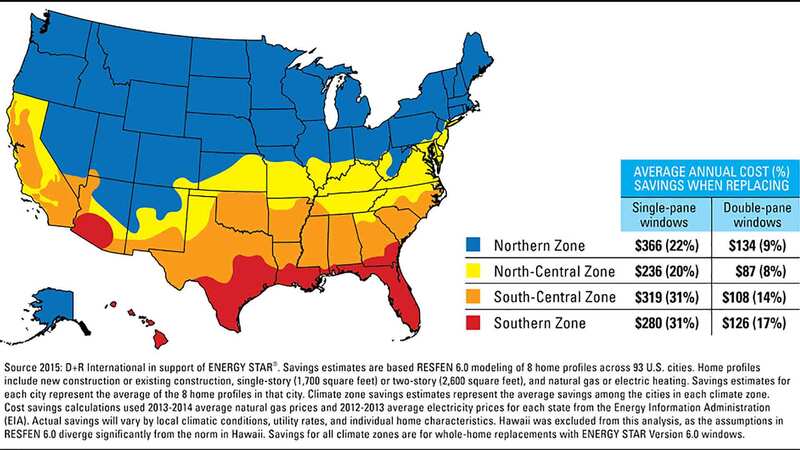 You can see that northern zone climates such as New England, the Midwest, and the Pacific Northwest has the greatest energy savings. These climates also happen to have more fluctuations between seasons than areas such as the south-central zone or southern zone. Universal Windows Direct offers UniShield® window installation for energy savings that lasts all year long. Contact us now for a FREE estimate, or visit our website to learn more..